Excitement is building as we prepare for the 100th Anniversary of Serbian Day at Kennywood Park, 1917-2016, on SATURDAY, July 16, 2016 as part of the Serb National Federation's 3-Day weekend, July 15-17, 2016. Let us share with you some historic moments from Kennywood history we've found in old newspapers from across the Tri-State area of Pittsburgh, so that you can feel the joy too! We'll be sharing more details with you about this year's celebration as they become firmer.... but in the meantime.... Enjoy! The Thursday, August 2nd, twenty-eight page evening edition of the Pittsburg Press newspaper in 1917 was only TWO CENTS. That’s the time when newspapers were sold in the morning and evening, and Pittsburgh didn’t have the “h” at the end of its name. But that edition was very special to all Serbs. It carried the FIRST report of Serbian Day at Kennywood, thanks to very enthusiastic Chairman, Stevo Babic of McKeesport, PA and Secretary of the Arrangements Committee, Bozo Mamula, of Pittsburgh’s South Side. 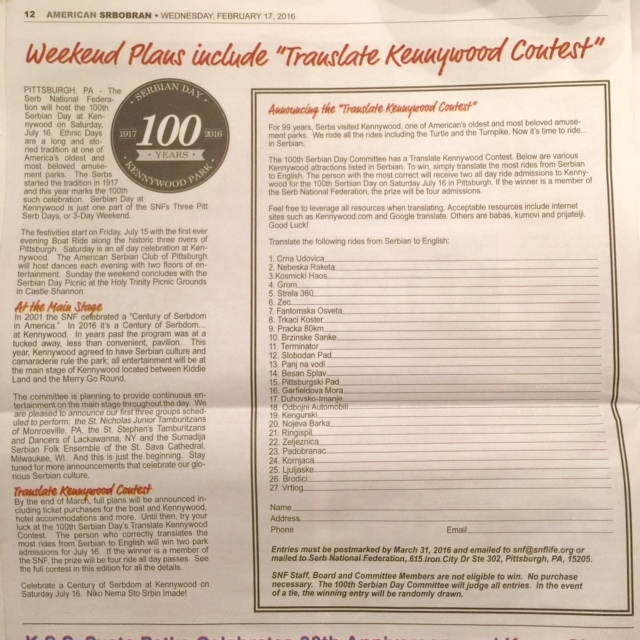 That’s how we hope that all Serbians throughout the USA will find the time to join in the festivities of the Serb National Federation’s Salute to Serbdom’s 100th Anniversary of Serbian Day at Kennywood as part of the 3-Day weekend, July 15-17, 2016. Not only to come and help fill the ranks and file for this historic occasion, but to let your whole community know about what’s happening like the Serbs did, whether they lived in Pittsburgh, Johnstown, Uniontown, Masontown or the Beaver Valley. 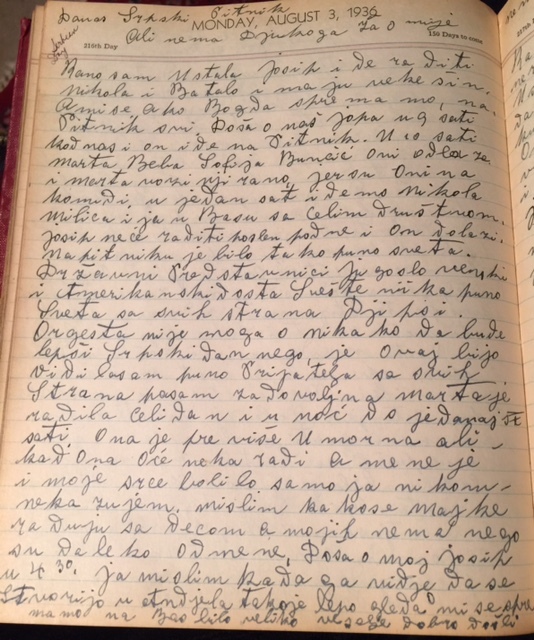 Here's an entry from 1936, the 21st Serbian Day at Kennywood Park! Today is the Serbian picnic. "I got up early. Joe (son) went to work, but Nikola (husband) and Batalo (border) have vacation. And we, God willing (Ako Bog da), are getting ready to go to the picnic. At 10:00, Marta (Daughter), Beba Latinka (youngest -Baby-Daughter Laura) and Sophie Buncic went early. Marty took them in her car early because they're on the committee. At 1:00, Nikola, Milica (Daughter) and I will go on the bus with our whole Lodge (#11-Vojvoda Stepa Stepanovich!). Joe isn't going to work in the afternoon so he'll be coming later. "At the picnic there was everything you could think of, everything! They brought in the flags and sang the American and Yugoslav national anthems, and there were priests from all over, and a Gypsy orchestra. There was no way it could be an any better Serbian Day than this one because I saw so many of my friends from all over (Svih strani!) so I was so pleased and happy. "Marty worked the whole day and night until 11:00 at night. She's really exhausted, but when she wants to work like that, let her. "However, my heart is broken, but I can't tell anyone how I feel that my two children (George in the Army, Rose in Belgrade) aren't here with us. I saw so many mothers with their children, and mine are so far away from me. Marty (oldest daughte married to Paul Belosh) and Pi (P.B.) and I got ready to go to the picnic. It was so nice. Milica, me, and Marty, but Marty was always with other people surrounding her. She was like a peacock amongst the birds. ("Kao paun medju pticima!"). She couldn't be more beautiful, and she was dressed so expensively magnificent. I saw many of my friends and we all talked so beautifully. I rode some and I walked around a lot. My dear Vladimir. (Thinking aloud about her grandson in Europe.) We came home at 12 o'clock midnight. Milica went to see the baby and I went to bed.﻿"
at Kennywood, July 16, 2016, right before we all lined up to make the 1,000 person KOLO line around the Lagoon! 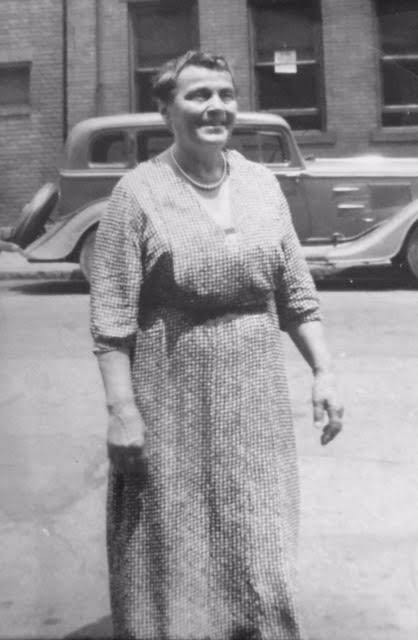 Happy 100th birthday! Happy SLAVA to all of you here today who chose to help celebrate this historic moment, one beautiful birthday party commemorating our pioneers’ efforts to create a SERBDOM that has guided and sustained us all these years! Bask! Bask in the glory of knowing that you are here today—descendants of those early pioneers. We are the FIRST such ethnic group at Kennywood Park to reach this great milestone! Happy 100th! The first event was recorded for history in the early evening edition of the Pittsburgh Press of Thursday, August 2nd, 1917, carrying the report of Chairman Stevo Babic. 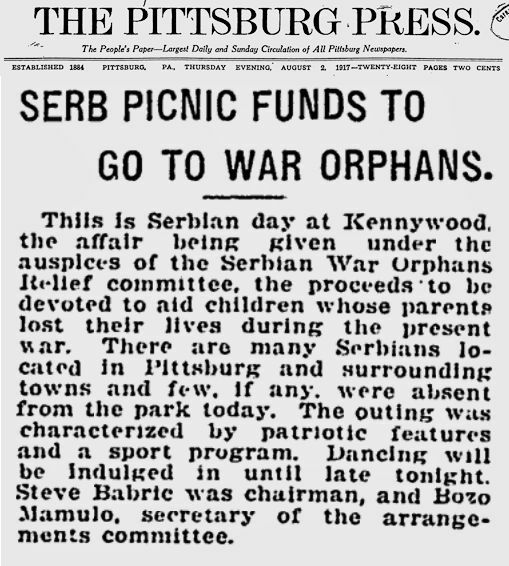 That 1917 Pittsburgh Press newspaper account read: “There are many Serbians located in Pittsburgh and surrounding towns, but FEW, IF ANY, were absent from the park today!” How smart they were to make sure all of Pittsburgh and the surrounding areas knew of this great accomplishment of the Serbian War Orphans Relief Committee! How did the first Serbian Day at Kennywood start? War was raging in Europe, and thousands of Serbian children were left orphans, as the Serbs lost almost ½ of their male population and between ¼ to 1/3 of their total population from which they have never recovered. While +St. Bishop Nikolai was asking for help speaking to thousands at St. Paul’s Cathedral in London, great physicist scientist Michael Pupin of Columbia University in New York was heading up the Relief Efforts throughout America and Canada. Pupin called upon his good friend, Stevo Babic of the Greater Pittsburgh area, to help. 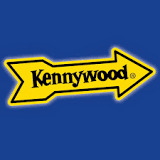 Stevo’s good friend, Mr. Joseph McSwiggen, was the owner of Kennywood Park. Babic asked McSwiggen to donate the use of the park for the day, and he agreed to let the Serbs garner a percentage from the sale of tickets for the amusement rides, thus leading to what we now know as Kennywood’s famous “Nationality Days” for all ethnic groups. Throughout the years that followed, so many great projects occurred because of you, your parents, grandparents and great-grandparents. 1.The Serbian/Yugoslav room here in Pittsburgh at Pitt’s Cathedral of Learning. 2.The late Lt. Col. Mitchell Paige, awardee of the Congressional Medal of Honor, helped raise one of the biggest amounts of money for American War Bonds during WWII. 4. Scholarships here in the USA. Collectively over the years, we have witnessed Beauty contests, athletic events, choirs, folklore groups and tambura bands from all over the USA here at Kennywood, all the while having fun and such a good time. And now, TODAY, we all are part of history! Thank you EVERYONE for being here! Ziveli, SRBI! 100 Years of SERBDOM at Kennywood! If you click on the lower right hand corner, you'll be able to enlarge the image above. Many people are participating and some as far away as the Netherlands, hoping for a chance to win a free admission to the park. "Most look up to admire the stars. A Champion climbs a mountain and grabs one!" Get Yourself to Kennywood for July 16, 2016!
! If Plan "A" doesn't work, there are 25 other letters! Then there was this post from the Morning Herald in Uniontown, from July 19, 1973. “The aroma of BBQ lamb, home baked bread and fresh green onions will herald the 56th Annual Serbian Day at Kennywood. Sponsored by the SNF, this is one of the largest reunions of Balkan people in the country. Hundreds of lambs will be BBQed for the occasion as has always been the custom, this being the traditional Serbian Festival food. The program will be held at the Starvue Plaza at 6:00 PM, to feature nationality music and gaily costumed dancers. The main speakers for the program are Mr. William Salatich, President of Gillette Razor Co. Also speaking will be Leonard Staisey, Allegheny County Commissioner. “Reverend Nedeljko Lunich, of Indiana Harbor, will receive the Serbian Man of the Year Award. Special music will feature Vinka Ellison of Ventura, California. She is known as the “Queen of Sevdalinka” and Mr. Ted Erdel, a member of the Pittsburgh Opera Chorus. The talented Tillie Klaich and his Balkan Serenaders of Lackawanna, NY will join in the festivities. In full native costume, the St. Nicholas Orthodox Church Jr. Tamburitzans of Wilmerding will play, sing and dance. There are 38 youngsters in the group. President Robert Rade Stone will preside. “Today will be Serbian Day at Kennywood Park. Steve Babic, Chairman of the Serbian Relief Committee, will be in charge. All Serb peoples from Allegheny County will celebrate this holiday. There will be an athletic meet with prizes. Folk dances and native songs will be featured. Picturesque peasant costumes will be worn. The park will be decorated with American and Serbian flags.” That was the 5th S.D. at Kennywood! Here’s one of my favorite finds. It’s from the Pittsburgh Press of July 30, 1944, during WWII. 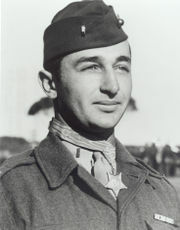 “Mitchell Paige, Congressional Medal of Honor winner from West Mifflin (Charleroi!) will supervise a bond rally at the Serbian Day outing at Kennywood Park tomorrow night. “Nick Pavlovich, Chairman, yesterday announced the hero’s appearance would highlight the program which begins at 6:00 PM on the open air stage. About 25,000 district American Serbs are expected to attend. The program will include speeches from L.C. Christopher, Gary, Indiana, President of the Serb National Federation, and Steve Babic, Duquesne, Chairman of the first Serbian Day 27 years ago. This reporting should bring back many happy memories. My father always thought the Neven Orchestra with Milan Shatlan, was one of the best! Seeing that there was a “Marijana Singing Society of Steubenville” makes me think about the four Maksimovich Brothers who appeared at the first Serbian Singing Federation Festival in Akron, OH, where they first introduced the song to an enthusiastic crowd in 1936!